Parathyroid crisis is a rare endocrine emergency, but such presentations do happen in this day and age. It is imperative for clinicians to have low threshold for measuring serum calcium in any one with unexplained skeletal symptoms and lethargy. Parathyroid crisis or parathyroid storm is a rare but potentially fatal complication of primary hyperparathyroidism. Primary hyperparathyroidism is often easily misdiagnosed or overlooked as symptoms of hypercalcemia are generally nonspecific and not as straightforward as the medical college mnemonic “stones, bones, abdominal moans, or psychic groans.” We report a case of parathyroid crisis that highlights the importance of including hypercalcemia in the differential diagnosis in patients presenting with atypical symptoms. A 41-year-old previously fit female presented with a 3-year history of severe body aches, bone pain, and gradually decreasing mobility to the extent that she was practically bedbound. Multiple specialists had seen her over the 2-year period including rheumatologists, neurologists, orthopedicians, and physiotherapists in different hospitals. The “branded” diagnosis was severe rheumatoid arthritis, for which was given multiple doses of steroids with worsening symptoms and confusional state. Examination revealed a patient in severe distress with the classical “bones, abdominal moans, and psychic groans” (no stones). Laboratory investigations revealed severe hypercalcemia with corrected calcium of 17.5 mg/dl (normalized ratio [NR]: 8.5–10.2 mg/dl), serum parathormone in excess of 3000 pg/l (NR: 10–65 pg/ml), and a grossly elevated alkaline phosphatase. Radiological parameters revealed radiolucency with osteoporotic fractures of left humerus and left proximal and distal femur on X-rays. Computed tomography scan of the knees showed distal femur fracture with classic lytic lesions [Figure 1]. Ultrasound of the neck showed a large right superior parathyroid adenoma which was confirmed on Sestamibi scan [Figure 1]. There was no evidence of internal malignancy. She underwent a parathyroidectomy, and histopathology was confirmatory of large parathyroid adenoma with no evidence of malignancy. As expected, she had a brief period of severe hypocalcemia postoperatively (hungry bone syndrome) but recovered well with no sequelae. The fractures were conservatively managed, and by 4 weeks, she was pain free, within 3 months, she was able to weight bear with walkers, and by 5 months, she walked into our clinic unaided with radiological evidence of bone healing. We report a case of severe life-threatening parathyroid crisis due to a large parathyroid adenoma missed over a period of 2 years by a number of specialists. 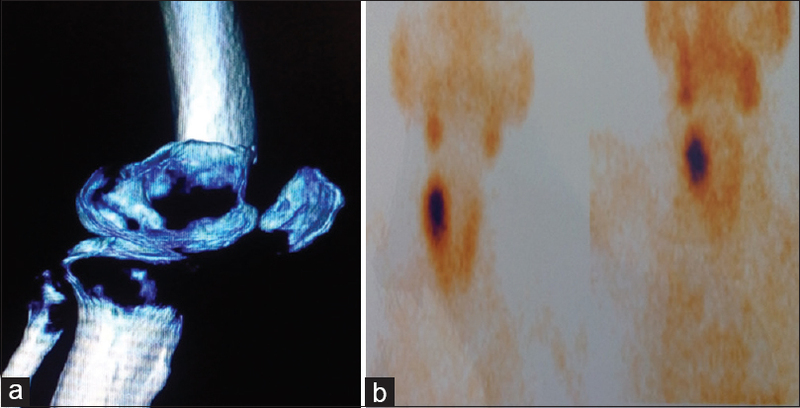 Identification and successful surgical management of the parathyroid adenoma not only led to a complete resolution of symptoms and mobility without any need for orthopedic intervention for the severe parathyroid bone disease, but also probably saved her life. One wonders whether parathyroid crisis in this day and age of easily available low-cost calcium testing is a crisis of specialization, similar to the parable of the blind men and elephant, rather than a crisis of the parathyroid. Our patient never had a calcium level checked for 3 years in spite of worsening symptoms. While primary hyperparathyroidism was increasingly detected since the advent of automated calcium analyzers about three decades ago, this condition is at risk of becoming a forgotten entity due to the appearance of random access analyzers, which allow selective analysis of chemistries. However, even in tertiary referral centers where calcium is routinely tested, primary hyperparathyroidism seems to be significantly missed. In a study of 2.7 million patients from a referral center who had their calcium levels screened as outpatients, 2% had hypercalcemia. Even after identifying hypercalcemia, 67% of those patients never had a parathormone level measured. It was estimated that this would have missed 28% of primary hyperparathyroidism. Parathyroid crisis is a rare endocrine emergency, with a couple of long-term studies estimating the risk of 1%–2% in those with known primary hyperparathyroidism., The crisis is characterized by severe hypercalcemia with calcium values >15 mg/dl and central nervous symptoms as in our case. Patients from India with primary hyperparathyroidism seem to present at a younger age and have more severe biochemical abnormalities with predominant skeletal symptoms in >50% of patients. It is imperative therefore to routinely check serum calcium at least in those who present with bone pain in the Indian subcontinent so that cases like the ones presented in this case report can be avoided. Our case highlights the need for all specialists to do the “internist hat” in difficult nonresponsive cases to ensure that easily treatable conditions are not missed. Salinas M, López-Garrigós M, Pomares F, Lugo J, Asencio A, López-Penabad L, et al. Serum calcium (S-ca), the forgotten test: Preliminary results of an appropriateness strategy to detect primary hyperparathyroidism (pHPT). Bone 2013;56:73-6. Press DM, Siperstein AE, Berber E, Shin JJ, Metzger R, Monteiro R, et al. The prevalence of undiagnosed and unrecognized primary hyperparathyroidism: A population-based analysis from the electronic medical record. Surgery 2013;154:1232-7. Corlew DS, Bryda SL, Bradley EL 3rd, DiGirolamo M. Observations on the course of untreated primary hyperparathyroidism. Surgery 1985;98:1064-71. Scholz DA, Purnell DC. Asymptomatic primary hyperparathyroidism 10-year prospective study. Mayo Clin Proc 1981;56:473-8.